Cell phone appending has become a mainstay at BCI for clients that realize the inherent advantage of making timely calls to their constituents wherever they are. That includes the grocery store, driving, and yes even the restroom. But fortunately, the issue of cell phone privacy has subsided, as the expectation of personal and business calls via cell is the new norm. 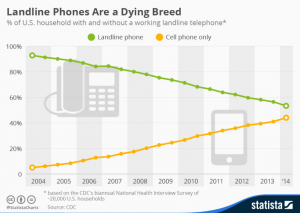 It’s no surprise that many households have dropped landlines altogether. In fact, nearly 49% of all American adults now live in wireless-only households, and 68% in ages 25-34 (Source: CTIA Dec. 2017). Add the fact that many individuals are reluctant to answer incoming calls on their house landline — anticipating suspicious telemarketers, and you’re left with few options to engage in direct conversation with your constituency. Although a clear strategy to reach your alumni by cell phone should be well thought out in advance, the conventional wisdom remains to tread lightly and be particularly sensitive to individuals’ who express privacy concerns. Like all multi-media messaging, good timing and relevance to campaign objectives through phone contact is key. However, your callers could be at a big disadvantage if they are not aware the person they are calling is on a cell phone. It stands to reason since one call may be the single best opportunity to engage a new donor – perhaps for life, necessary adjustments to the way the call is handled must be factored in. BCI’s provides the insight your callers need to bring their A-game by identifying the type of phone number on virtually every number in your constituent database. Specifically, we match your phone number information through SS7 Network technology – the global standard by which wireless carriers conform to, including procedures and protocol for network elements that affect call set up, signalling, routing, inter-network roaming, and control. SS7 is essentially the “glue” that connects circuit switched (traditional) networks with Internet protocol-based networks. Once processing has been completed, BCI will append a unique verification code to confirm all matches. This coding process results in match rates of approximately 98% on all records submitted. 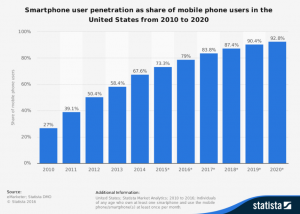 The share of Americans that own smartphones is now 77% — up from just 35% in Pew Research Center’s first survey of smartphone ownership conducted in 2011. Today there are more than 396 million wireless connections in the US, equal to 121% of the U.S. population. America’s wireless companies stand ready to invest $275 billion into building next-gen 5G networks. This will create 3 million new jobs and add $500 billion to the US economy.